In the run up to the release of the Fire Phone in 2014, everyone was expecting to launch an unlocked budget smartphone which ran Amazon's version of Android, came bundled with its apps, and was sold cheap so that Amazon could use it to sell you stuff. That never happened. Instead we got a $600 Fire Phone which was tied to AT&T, had more cameras than anyone really wanted, and didn't really offer any compelling feature. It was a fiasco, and effectively killed Amazon's smartphone plans - until today. Liliputing, BGR, and other sources reported this morning that Amazon has made its second venture into the smartphone market. 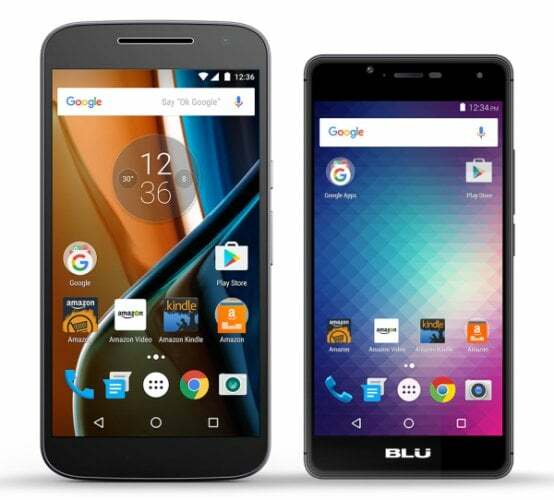 The tech giant is offering a pair of budget smartphones to Prime members at prices of $50 to $75 off. One of the phones, the just-announced Moto G4, usually retails for $200 and can be had in this sale for $125. The other phone is a quad-core Android phone called the BLU R1 HD. It usually costs $100, but costs just $50 with this sale. This discount exists so Amazon can place ads behind the lock screen, just like it does with the subsidized Fire tablets and Kindle e-readers. Swipe to unlock, and barring any personal notifications, a full-screen ad greets you. If you have Twitter mentions or New York Times news alerts to catch up on, you’ll skip the big ad and see them as usual, with an extra bar notification hawking the latest Kindle sale. The other twist is that these devices come loaded with Amazon apps. Like, all of them. There’s shopping and Kindle, sure, but also the Amazon Underground app store, Audible, IMDB, and Amazon Video. Not to mention less mainstream apps like Goodreads, Prime Now, Alexa, Amazon Music, Amazon Drive, and Amazon Photos. Phew! These phones may not bear Amazon's brand but they are absolutely being sold under the same model as the Fire tablets. And while the phones aren't running Amazon's version of Android, like the Fire tablets, that just goes to show that Amazon has learned from its mistakes. As the Fire Phone debacle demonstrated, media tablets like the Fire tablets can get by without Google apps but a smartphone cannot. A phone is more of a utility device while a tablet is an entertainment device, and so long as the consumer is committed to the Amazon ecosystem they won't miss the lack of a Gmail app. Coincidentally, the phones also tell us that a smartphone user is worth a lot more to advertisers than a tablet user, or at least that Amazon expects them to be worth more. Amazon is giving us a $50 discount off the smartphones, but only takes $20 off the price of a Fire tablet. The phones ship on 12 July. Do you plan to buy one? p.s. Check the price for the Moto G4–I’m not seeing it listed for $25. Hmmm…I take that back. According to the grid at the bottom, the Moto G4 IS compatible with Verizon’s network. I spontaneously gave it a one hundred dollar discount. Going through an ad every single time you unlock your phone is just too much. Since you can get a better phone without ads and paying less by just locking in on a contract I can’t see there being a market for this. Should end up in the same place as the first fire phone. I understand it being $50 instead of $20. Phones are the number one device that we use throughout the day. Ads on a phone are significantly more intrusive than they are on a tablet or ereader. But it also means that you would see them more often making it worth more to Amazon. Great idea. The higher discount probably reflects the higher profit margin on a phone versus a Kindle eReader or tablet. And honestly, the lock screen ain’t something I spend a lot of time on. Perhaps it will even be like the Kindle where you can pony up fifty bucks down the line and remove ads. Phones in this go around are too low end for me but I’m in with the right phone. I don’t want to see ads, I block them so I would never get Amazon’s new phones. I can see these making a profit due to the constant ads. It is good these run standard Android, Google support is required in a smartphone. We’re keeping our 3 Fire Phones indefinitely. If one breaks, we might consider one of these Moto Gs.